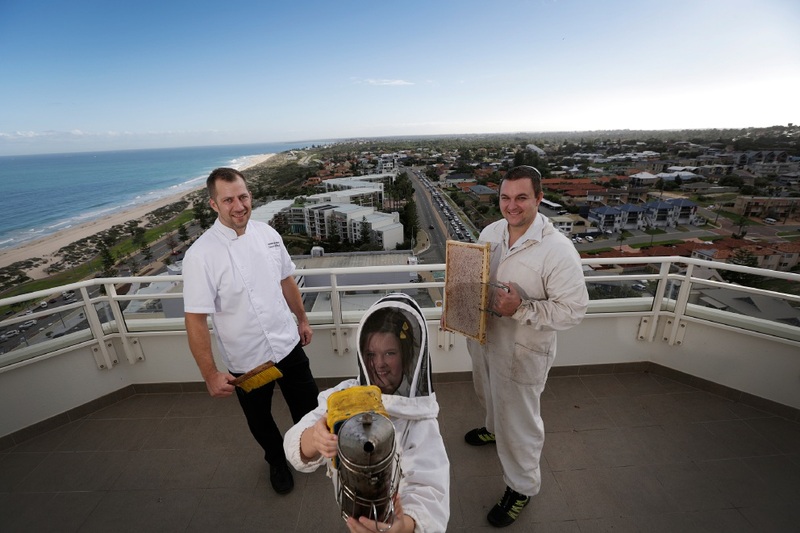 A SWARM of bees has been living the high life at the top of an iconic Scarborough hotel. Two hives are busy working to provide the Rendezvous Hotel with up to 100kg of fresh, natural honey per year. Beekeeper Tristan Campbell, of Maylands-based Honey I’m Home Produce, said there had been a buzz around urban beekeeping in Perth. “We’ve seen a growth in the amount of urban hives in Perth,” he said. Mr Campbell said in comparison to bush honey, urban honey was a surprise with each harvest. “You’re never quite sure what you are going to get with urban honey because there is such a huge range of flowers in the city,” he said. Executive chef Wendelin Ulrich said the idea came about when Honey I’m Home Produce had a stall at the Scarborough Feed Box markets. “The whole ideology behind the food that I do is to try get as much local produce wherever possible so every little step helps. That’s why we wanted to source local honey but when we realised we could do it in house, it was even better,” he said. Mr Ulrich said more people were choosing natural and preservative free foods. “There is a massive growth in the last five to six years with people taking an interest in where their food is actually coming from,” he said. “Shangri-La Hotel in Sydney has eight hives on its rooftop so it is obviously producing quite a bit of honey and it’s started doing honey dinners as an educational event, which is something we’d eventually like to get to as well. Mr Campbell said WA’s diverse floral plants and gum trees created ideal conditions for bees. “We’ve got some of the healthiest bees in the world here in WA, so we’re really lucky,” he said. Despite the hives being at a hotel, Mr Campbell said being afraid of stings was unnecessary. “The managed hives have a nice calm queen so you can walk right up next to them and watch the bees going in and out,” he said.